VANCOUVER - Jared McCann and Jake Virtanen spent a nervous Sunday waiting to learn their immediate fate with the Vancouver Canucks. "It was tough," said McCann. "We were sitting there watching the baseball game, sweating a little bit. It definitely wasn't an easy time." The 19-year-old forwards could exhale, at least a little, on Monday after being told they will be staying with Canucks to start the season. "Still trying to soak it in right now," said Virtanen. "It's pretty exciting." Virtanen, the sixth overall pick in 2014, and McCann, who was taken 18 spots later, had strong performances in training camp and during the exhibition schedule with two goals and two assists each in six games. Vancouver also decided to keep another rookie, 22-year-old defenceman Ben Hutton, with the big club ahead of Wednesday's opener in Calgary against the Flames. 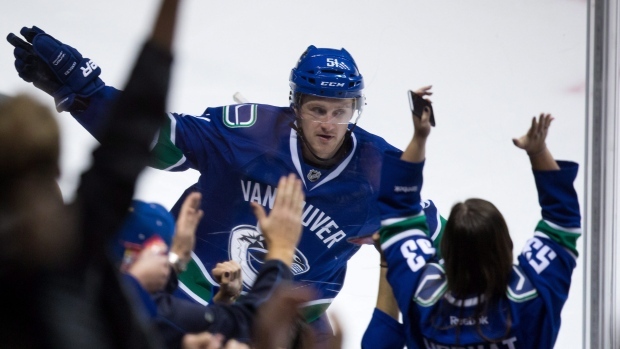 "You don't just get lucky," said Canucks head coach Willie Desjardins. "There's no luck. You get what you deserve ... those guys are ready, they're good players." With veteran winger Chris Higgins out with a broken foot, 30-year-old Adam Cracknell also made the team, likely on the fourth line. The Canucks still have a bit of wiggle room with Virtanen and McCann if things don't work out early in the season. Both are too young to play in the AHL and their only option is being returned to junior, but they won't have the first year of their entry-level contracts burned until each plays a 10th NHL game. It's not something the team is focusing on, but the players are well aware they still have lots to prove. "It's in the back of our minds," said Virtanen. "We still have to make this team and guys are pushing for jobs still." Hutton, who could have been sent to the AHL without having to clear waivers, was a relative unknown coming into camp after a strong rookie tournament in mid-September. A fifth-round pick back in 2012 who played three years at the University of Maine, Hutton showed he belonged on a team that was looking to add some speed and creativity in defence. "I had no idea I would be here at this point, I'm going to be completely honest," Hutton with a big grin. "But I am and I'm happy so I'm just going to keep rolling with it." Canucks captain Henrik Sedin said he was glad to see players who deserved a spot stick with the club. "You hear every year about guys coming in and getting a chance and everyone's fighting for the same job, but you never follow through on that," said Sedin, who is entering his 15th season. "They're really good people. They come in, they work hard, they don't expect to be given anything. They work for what they get. That's all you can ask for." To make room for McCann, Virtanen, Hutton and Cracknell, the Canucks placed forward Linden Vey and defencemen Frank Corrado and Alex Biega on waivers. Desjardins said cutting Vey and Corrado was especially difficult. "I feel for those guys. It's hard. When we wrote up our lineup in the summer both guys were on the team. That's where we felt they'd be," said Desjardins. "They didn't have bad camps, it's that other people had real good camps." The Canucks could lose all three on the waiver wire ahead of assigning them to the AHL, with Corrado and Vey the biggest risks. The 24-year-old Vey had 10 goals and 14 assists in his first full NHL season with the Canucks in 2014-15 after being acquired from the Los Angeles Kings for a second-round pick. Corrado, meanwhile, has been viewed as one of Vancouver's top defence prospects, but the 22-year-old was passed by Hutton in the pecking order. "On our team I want guys to compete for spots," said Desjardins. "If you're not doing your job then we're going to go to somebody else."